We're still a few months away from The Meg hitting theaters, but a new TV spot has been released to make sure we don't all forget about the giant shark that makes Jaws look like a goldfish. The first trailer was released a few months back and the latest TV spot utilizes some of the same footage along with some new clips that are tailor-made for Shark Week. The 75-foot shark is called the Megalodon and Jason Statham is out to stop the prehistoric giant from gobbling up ships and beachgoers. 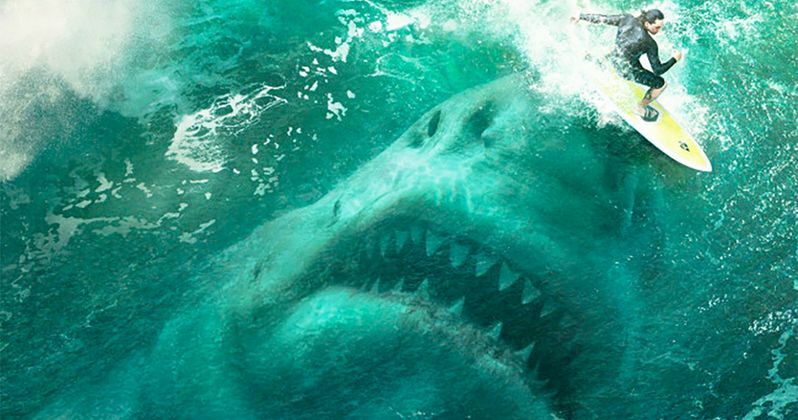 Some have already criticized The Meg for looking like a higher budget Sharknado, and they might be right, but it sure looks like a lot of fun. The first trailer seemed to blur some lines of whether the film is tongue-in-cheek or not and the new TV spot does the same thing. There are some moments that look horrific while there are others that look like they're out of a straight up absurd comedy. That being said, it looks awesome either way. The little dog that was showcased in the first trailer for The Meg is back, which seems to be one of the more important scenes in the TV spot. The scene is perfect at instilling fear while also showing something memorable, which will more than likely have a small piece of screen time as it turns into the tiniest of snacks for the Megalodon. Still, one of the best scenes from both the trailer and new TV spot has to be all of the beachgoers in the water, looking like a giant bowl of Fruit Loops, ready to be devoured by The Meg. The Meg stars Jason Statham (Furious 7) and Rainn Wilson (The Office), Li Bingbing (Transformers: Age of Extinction), and Ruby Rose (John Wick 2). Statham has recently said that if the movie does well enough, a sequel will be produced, which means that there could be a lot more of The Meg coming our way in the near future, which could be a good or a bad thing. Judging by the trailer and TV spot, it's a little bit of both in perfect harmony, so a sequel is pretty much almost guaranteed at this point. The Meg will swim into theaters on August 10th, which means that it will more than likely be the most aired commercial during Shark Week this year, which airs a few weeks beforehand, starting July 22nd at 8 PM. And if that wasn't enough, Sharknado 6 will premiere right in the middle of Shark Week this year, so the end of summer is going to have plenty of material for those who are fans and those who are not fans of sharks. You can check out the brand-new trailer for The Meg below, thanks to the Red Robot King 7's YouTube channel.